i really liked this movie. it is a dark comedy so it is not for everyone, but it is worth just for brendon gleason's performance. best movie i've seen in a long time, anyone who says otherwise is the reason modern films are so god awful,the simple minded unfortunately also happen to be the majority. very funny movie. gleeson gives a hilarious performance. Brash, unfussy and extreme odd film about a crude, unfussy Irish country cop who gets mixed up in a drugs investigation and has to work with a very erudite FBI agent. Brendan Gleeson and Don Cheadle make one of the best odd couple/cop/buddy pairs in film history. The film is quietly eccentric, proudly profane and thoroughly entertaining. One of the best movies of 2011! One of the best movies I have seen for a long time. Did not like it at first, but it just kept getting better. I took a really hard to please guy friend to see this movie. We both really enjoyed it. Be warned it is profane. It is also amusing and unexpectedly warm. 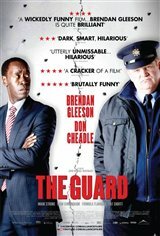 If you are looking for something different with some substance, go see The Guard. A dead-tone comedy that is dead on. very boring movie, I didn't like it. 2 out of 5 is the most I'd give it. A great performance by Don Cheadle yet again in this movie. A dark comedy with an edge. This is one of the best films of the year. Such crazy dark comedy here and with some pretty epic scenes in the end. Very memorable film and sure to get an oscar nom for it's screenplay, I would assume. An Irish friend visiting TO wanted to see The Guard and I politely went not expecting much. My mistake - darkly funny scenes mixed with poignant moments - I often couldn't resist laughing out loud and got a little choked up at the end - not to be missed! i laughed, i cried, i saved 5 bucks! I liked the dry, dark Irish humor. Amazing ... a real surprise! This movie was entertaining with its comedy and "suspenseful" drama! It was great seeing Don Cheadle in this role! Should be more movies like this. One of the best movies this year. I loved this movie, it was awesome. It was funny. The Brits really know how to make flicks. The guard was so off beat funny, what a personality. Stupid and smart at the same time. Really good, see it and be entertained, very entertained. Not overly impressed with this movie. I was bored half way through because the ending was so very predictable. Excellent movie - would see it again. I loved it! for me it was a great movie! This movie was funny but a bit difficuly to understand if you're not used to the accent! Love Don Cheadle too! Definitely a great rental for an entertaining night at home with friends.